Dr. Ali and Dr. Chen are Fellows in Musculoskeletal Radiology, RadNet Management, Los Angeles, CA. Dr. Crues is the Medical Director of RadNet Management, and a Volunteer Clinical Professor of Medicine, University of California-San Diego School of Medicine, San Diego, CA. 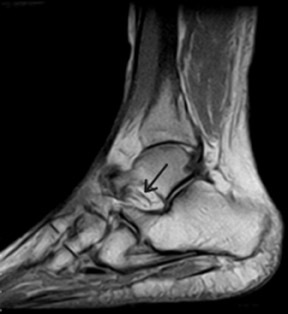 In an article published in the August 2006 issue of this journal, the authors reviewed magnetic resonance imaging (MRI) of the ankle. 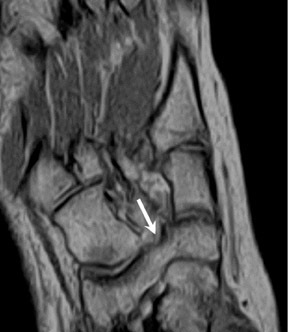 This article will present a review of the use of MRI in the evaluation of the foot, detailing bone and cartilage abnormalities as well as sinus tarsi pathology. The discussion will address the evaluation of the foot in hindfoot, midfoot, and forefoot subsections. 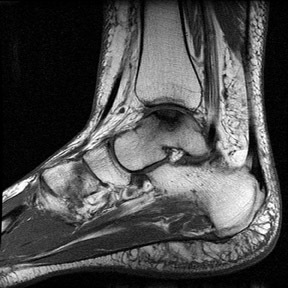 Depending on the clinical question, MRI of the foot should be tailored to a hindfoot, midfoot, or forefoot examination. For hind- and mid-foot, a 12- to 14-cm field of view is applied. For the forefoot, a 10- to 12-cm field of view is used to image the smaller peripheral joints in detail. Similar to the ankle, the foot is placed in a neutral position for high-field-strength scanners and in approximately 30˚plantar flexion for extremity scanners. The pulse sequences for the mid- and forefoot are T1-weighted (T1W) in the coronal and axial planes, short tau inversion recovery (STIR) in the coronal and sagittal or axial planes, and T2-weighted (T2W) in the coronal plane. For the evaluation of a mass or the diabetic foot, we add T1W sequences before and after intravenous (IV) contrast (gadolinium chelate) administration. On low-field-strength scanners, these are performed without fat saturation; on high-field-strength scanners, fat saturation is applied. Precontrast fat-suppressed images are essential to avoid the pitfall of pseudoenhancement of a mass on fat-saturated postcontrast images when compared with the non- fat-suppressed precontrast images. This is because of a narrow dynamic range of the contrast display on the fat-saturated images when compared with those without fat saturation. Talar neck fractures can lead to avascular necrosis (AVN) of the proximal fragment. 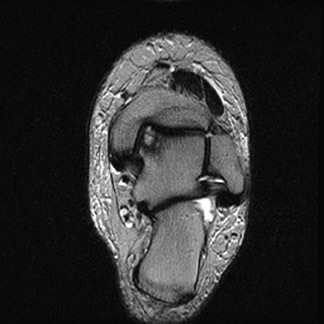 Stress fractures can occur in the talus but are less common than calcaneal stress injuries. Coalition of the middle talocalcaneal joint is second only to calcaneonavicular coalition. Osseous, fibro-osseous, fibrous, and fibrocartilaginous forms have been described. MRI findings include a direct bony connection or (in the case of nonosseous coalition) irregularity and eburnation of the articulating surfaces and visualization of low-signal fibrous bridging. Medial downsloping of the sustentaculum tali articulating surface (Figure 3) instead of the normal lateral slope and presence of a dorsal talar spur (not to be confused with the physiologic, more proximal dorsal spur at the capsular insertion) are useful ancillary findings. 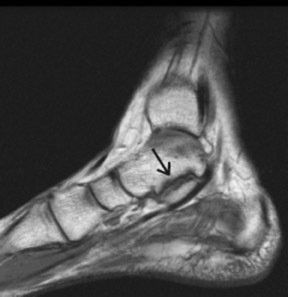 5,6 Calcaneonavicular coalition (Figure 4) is the most common of the tarsal coalitions. 5,6 As with other sites, it can be osseous or nonosseous. 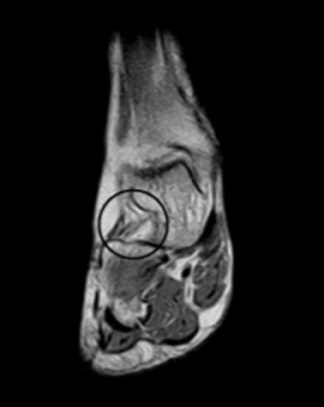 An elongated anterior process of the calcaneus (anteater nose sign) may be present. Some of the more common masses in the calcaneus include lipomas, solitary bone cysts, and chondroblastomas. Lipomas have characteristic fat signal. They can have central calcification or cystic focus that appears as signal void or fluid signal, respectively (Figure 5). Bone cysts in calcaneus are more common in the older age group (>20 years). They have fluid signal and are located in the calcaneus body more inferiorly as compared with the chondroblastomas. Chondroblastomas are more common in men in their second or third decade. They occur in a subarticular location and have high signal on T2W images and low signal on T1W images because of their cartilaginous nature. Low-signal foci of chondroid calcifications and linear low- signal septations may be present. Navicular osteochondrosis (Köhler's disease) is seen in younger patients (3 to 7 years of age). Fragmentation and low signal on T1W and T2W images are seen. 7 It must not be confused with the fragmented appearance of nonunited ossification centers. 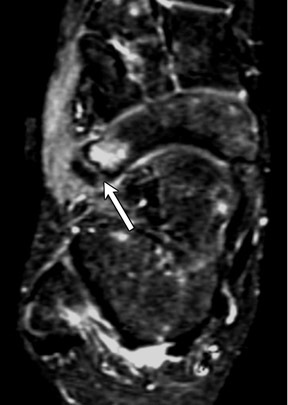 In adults, AVN secondary to trauma can occur (Muller-Weiss disease). 8 There is collapse and low signal of the bone on all pulse sequences. 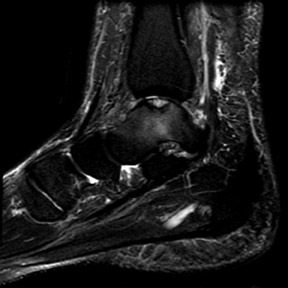 Bony changes seen with subtalar instability and inflammatory arthropathies are discussed with sinus tarsi pathology. The ligaments can be torn secondary to acute trauma or more commonly by chronic recurrent microtrauma. This can lead to subtalar instability with resulting degenerative changes in the joint. 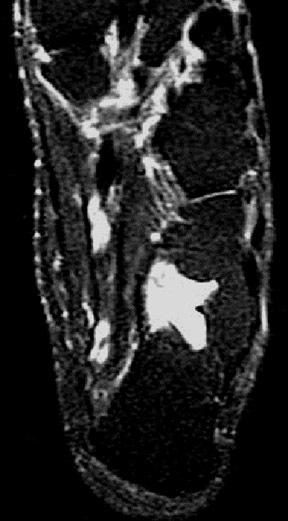 Articular surface irregularity and subchondral sclerosis with or without subchondral edema can be seen. Posterior talocalcaneal facet is involved to a greater degree. Normal fat signal in the sinus tarsi is replaced with edema or fluid signal. There is associated nonvisualization of the torn sinus tarsi ligaments (Figure 7). Plantar fasciitis is most pronounced within 2 to 3 cm of the calcaneal attachment. It manifests as a smooth thickening (>4 mm) of the plantar fascia, with adjacent subcutaneous edema. 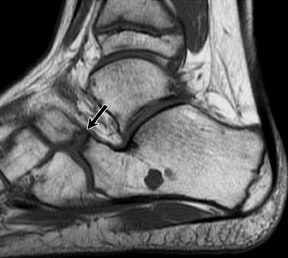 Edema may also be seen in the calcaneus at the insertion site of the plantar fascia (Figure 8). 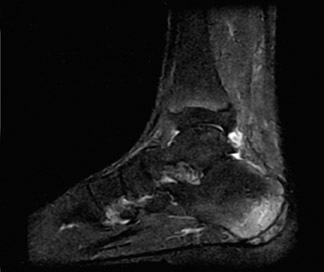 It is associated with a plantar calcaneal spur in approximately 50% of cases. Osseous abnormalities of the hindfoot were discussed earlier. 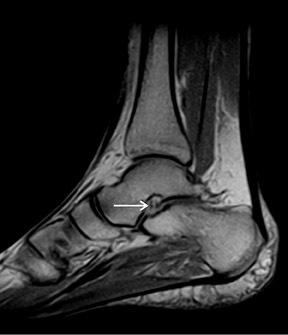 A traumatic tear of the Lisfranc ligament (a short bandlike ligament that extends from the plantar anterolateral corner of the medial cuneiform to the plantar posteromedial corner of the base of the second metatarsal) is an important injury (Figure 11). 17 It can lead to instability and progressive disorganization of the Lisfranc joint. Additionally, there can be loss of the medial longitudinal arch. The rupture of the ligament fibers is more common than is the avulsion fracture at the bony attachments. 17-19 It is an important diagnosis, since early internal fixation may give the ligament a chance to heal and can help to avoid the need for future arthrodesis. Even with early intervention, the success rate is <50%. The tarsal bones are a common site of trabecular stress injury. Marrow edema with a lack of a clear fracture line is present. The flexor hallucis longus (FHL) tendon is prone to tendinosis and tears at the knot of Henry. The mechanism is chronic repetitive friction with the flexor digitorum longus (FDL) tendon from activities like jogging. 20 This is analogous to the intersection syndrome between the first and second extensor compartment tendons in the wrist. The medial plantar nerve branches can get entrapped between the knot of Henry and the abductor hallucis muscle, leading to first and second toe plantar dysesthesias. Synovial sarcoma is a malignant neoplasm with predilection for the foot. It is predominantly seen in patients between the ages of 15 and 40 years. It is an aggressive neoplasm with a posttreatment 5-year survival rate of approximately 55%. 21,22 Local recurrence and pulmonary and bone metastasis are common. On MRI, it appears as a well-defined mass with a heterogeneous low signal on T1W images. On T2W images, it has a heterogeneous high signal (Figure 12). Cystic areas are common. Fluid-fluid levels can be present in close to 20% of cases. Foci of calcifications can lead to areas of low signal on T2W images. Heterogeneous enhancement is seen with IV contrast ad-ministration. It usually displaces the adjacent structures rather than invading them. Sometimes a small size, slow growth, and well-circumscribed appearance can lead to an erroneous diagnosis of a benign mass. 23 Other soft tissue neoplasm, benign and malignant primary bony neoplasm, and, less commonly, metastasis can all involve the midfoot. A common clinical question is the differentiation between osteomyelitis and a neuropathic joint. Certain findings (such as the presence of more focal involvement of the bones, skin ulcers, sinus tracts, and abscess) are more suggestive of infection (Figure 14). In early neuropathic joint, the signal abnormalities are centered on the joint. However, a clear distinction between infection and neuropathic changes is not always possible with imaging. The midfoot is often involved in arthropathies such as gout and rheumatoid arthritis. The findings on MRI include erosions, bone marrow edema, and synovitis. In the absence of a correlative history, these can be confused with osteomyelitis. Degenerative changes in the midfoot can be seen with altered mechanics or can be posttraumatic. Hallux sesamoids can be involved with fractures, AVN, and sesamoiditis secondary to inflammatory arthropathies or osteomyelitis. The medial sesamoid is more commonly involved with trauma, and lateral sesamoid tends to get AVN. Replacement of the normal marrow fat signal with edema signal can be seen. 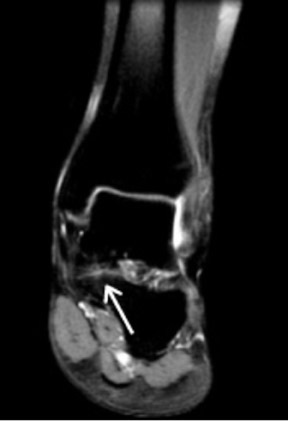 Freiberg's infraction of the metatarsal heads is characterized by fissuring, osteonecrosis, and eventual collapse of the subchondral bone (Figure 17). The second and third metatarsal heads are most commonly affected. 27 Repetitive microtrauma and vascular compromise are the most popular theories of the etiology. It is more common in young women and may be secondary to the wearing of high heels. In its acute stage, there is a marrow edema pattern. In its chronic phase, there is deformity of the metatarsal head and associated degenerative arthritis. "March fracture" is a stress fracture of the metatarsal neck. 27 The name comes from its common occurrence in military recruits. It is predominantly seen with activities that place excessive stress on the metatarsals, such as ballet dancing and gymnastics. Marrow edema and adjacent soft tissue edema are seen in early stages. Periosteal thickening is present in the subacute stage as a healing response. 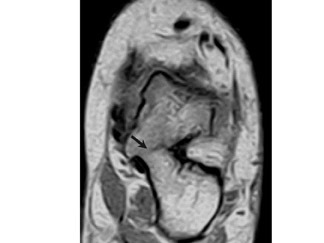 A giant cell tumor of the tendon sheath is a relatively common benign lesion. It is a focal form of extra-articular pigmented villonodular synovitis. It is low in signal on T1W images and is low-to-intermediate signal on T2W images (Figure 20). Other masses, such as foreign body granulomas, ganglion cysts, and malignant neoplasms (like synovial sarcomas or metastasis) can all occur in the forefoot location. The MTP joint of the great toe is the characteristic location for gout. Monoarticular involvement is common but not the rule. Gouty tophi cause characteristic erosions with punched-out, overhanging edges of the periarticular bones. They also occur at extra-articular locations with associated osseous erosions. Tophi have low signal intensity on T1W images and low-to-intermediate signal intensity on T2W images (Figure 21). 33 Variable enhancement is seen with IV contrast administration. Septic arthritis should always be considered in the differential diagnosis of monoarthritis. Rheumatoid arthritis and Reiter's disease are other common arthropathies in the forefoot. Osteoarthritis commonly involves the first MTP joint as well. MRI is the imaging modality of choice for evaluation of musculoskeletal pathology, including the soft tissue and osseous trauma, neoplasms, and inflammatory pathology. Compared with CT, MR provides a superior contrast resolution and exquisite detail of soft tissue structures. It also surpasses CT in the evaluation of trabecular bone injury. 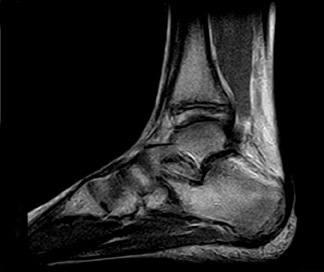 The strengths of MRI in evaluating various foot pathologies have been briefly reviewed in this article. 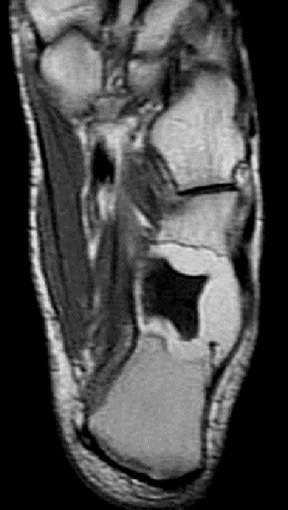 MRI of the foot. Appl Radiol.